THINKING about buying a new appliance? Want to save money on your electric bill? Confused about A, A+ or A++ ratings? Then come a speak to specially trained advisors in Noel Grimley Electrics Ltd.
Noel Grimley Electrics Ltd is now part of the European-wide programme to promote energy savings in homes. 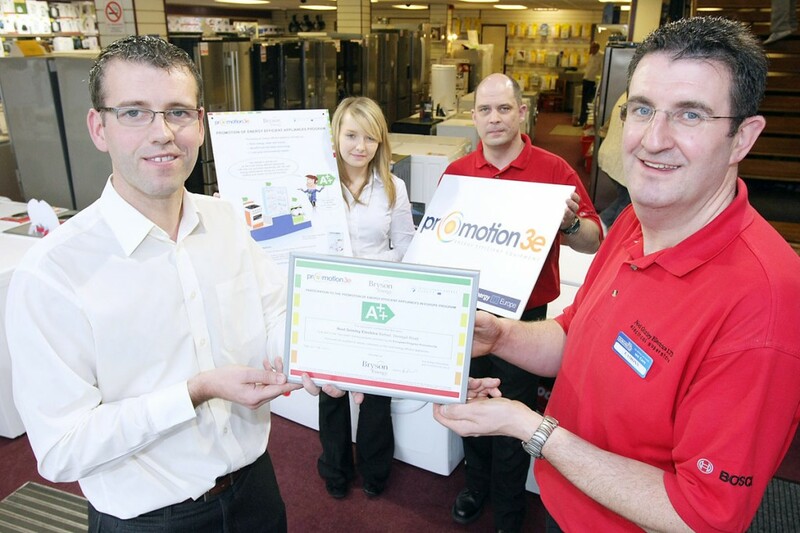 With two stores based on Donegall Road and Andersontown Road in Belfast, they are two of 455 retailers across eight European countries to sign up for an innovative education and awareness programme for both staff and customers on saving energy around the home. Over 16 independent electrical retail stores, who are part of the Euronics buying group, have already signed up across Northern Ireland. The European Programme is called Promotion 3e and is managed locally by Bryson Energy. The aim of the programme is to reduce household energy consumption by promoting the purchase of the most energy-efficient domestic appliances from washing machines to fridge/freezers (class A, A+, A++) and providing good practice tips in using such appliances. The programme will involve the staff being trained and certified on the energy label that is now displayed on a wider range of electrical products from washing machines to TVs. The training will be focused on energy-efficient appliances (washing machines, fridges, freezers etc) and advising consumers on the many benefits of these products. Research shows that homes now have on average 47 electrical appliances compared to 17 in the 1970s. These appliances alone make up to 47% of the average Northern Ireland household electricity bill. When purchasing a new appliance, having the right information and advice is crucial. This European programme is designed to train staff to advise customers on the most efficient electrical products available. For example, an efficient new fridge freezer consumes only half of the electricity of an inefficient older model saving up to £35 a year on electricity costs.